MDV FALL SALES EVENT IN PROGRESS. Click for details! 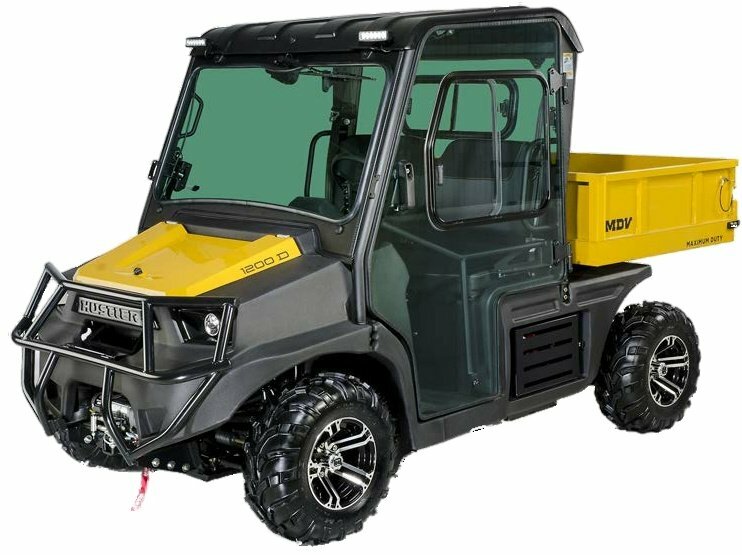 Imagine a tough, precision-built utility vehicle that combines the industry’s most popular features with the ability to lift, lower and dump its cargo at any point along its arc of motion. That’s what the most innovative team in the turf industry has created in the Hustler MDV with patented LeveLift bed technology. 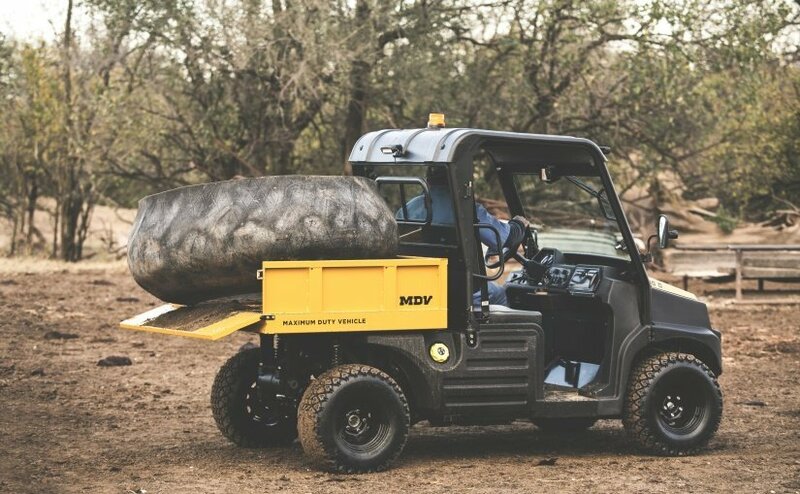 We call it the MDV (“Maximum Duty Vehicle”) for the simple fact that you won’t find a more rugged, more durable, more versatile utility vehicle in its class than this one. See LeveLift Technology In ACTION! At over 50″ wide the MDV’s spacious cab is easy to get in and out of with heavy clothes, coats, etc. 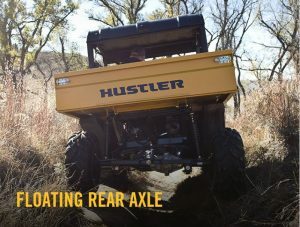 The Hustler MDV features a heavy duty drive train designed for demanding use on farms, construction sites, university campuses and much more. 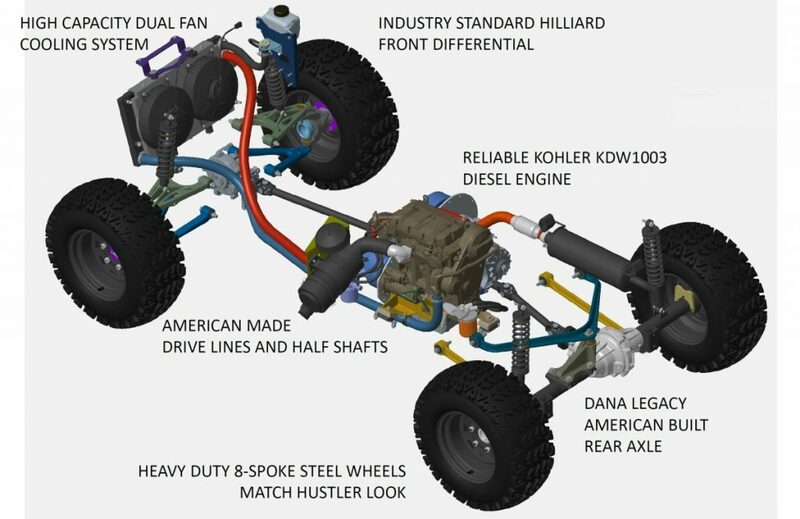 Featuring a reliable Kohler KDW1003 diesel engine, Dana legacy American built rear axle, Hilliard front differential and all American made drive lines and half shafts it is clear that the Hustler MDV is built for a long life of dependable use. The large dual fan cooling system is designed to keep the engine cool under the most punishing conditions. Easy-to-reach serviceability points equals better accessibility to maintenance areas. The MDV is designed to allow routine service to be completed in 30 minutes. Open the maintenance panel door on the drivers side and you can easily access the: air filter, battery, main fuse panel, fuel filter and check the oil. Brake fluid and engine coolant reservoirs can easily be accessed under the hood. UTVs have headed for the barn. The front fenders and side body panels on the Hustler MDV are manufactured using rotational molding technology. This process creates a much stronger, more impact resistant surface than the fiberglass fenders and body panels used on most utility vehicles. The MDV was designed with the farmer in mind. Here are some ways that the MDV with LeveLift technology can save your time and your back. Load hay bales or feed at ground level and dump over fences or into raised feeders. One person can easily transport small equipment (pumps, generators, feeders etc.) around the farm without risking back injury. With LeveLift you can raise the bed to pickup bed height and easily transfer cargo or lower it to the ground. Do you have more ideas to ad to the list? Let us know using the form below. The MDV with LeveLift technology can save your organization time & money. Think about the jobs that the employees in your organization do everyday and imagine the possibilities with LeveLift technology. Here are just a few of them to help you get started. Reduce back injury claims from people trying to lift items that are too heavy. 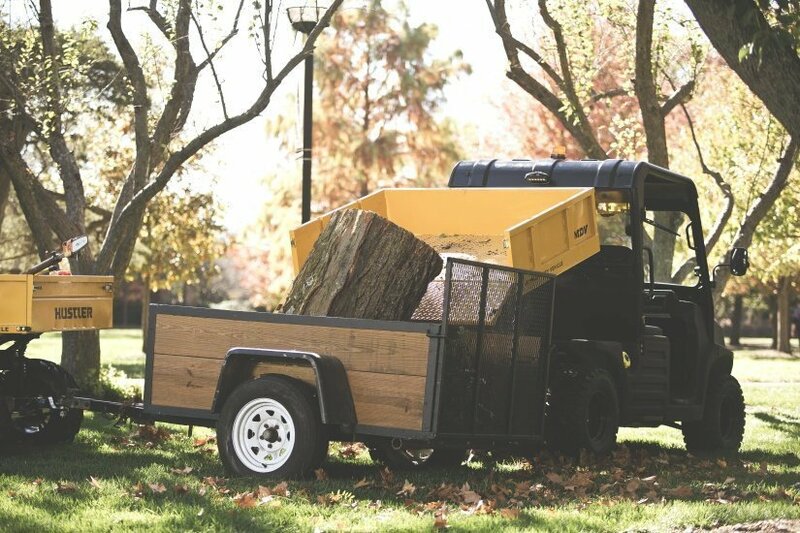 The fast top speed of the MDV makes it ideal for transporting people and cargo around large university campuses. The large 14 gal fuel tank ensures that you won’t have to refuel before the day is done. Have other ideas to add? Let us know using the form below. When you have places to go and things to build the Hustler MDV will help you get more done in less time. Save on labor cost and employee back injury claims. Dump soil, sand, mulch or other materials onto the top of a pile (when the bed is raised) or as much as 4 feet behind the vehicle (when the bed is lowered close to the ground). The bed can be dumped at any position of the LeveLift arc. The truck style floating rear axle allows transportation of heavy items without reducing ground clearing. Go where other vehicles can’t go. Maintaining a beautiful golf course requires a lot of hard work and dedication. You need a vehicle that will work just as hard as you do and provide labor saving technology so you can get more done in less time. The MDV with LeveLift technology meets those challenges with a resounding yes. Here are just a couple of examples demonstrating how the MDV can save your time, your back and your bottom line. Dump sand 4 feet behind the vehicle. This allows easy refilling of sand traps without backing into them. Transport walk behind greens mowers, trash cans and other cargo safely and easily with only one person. Oregon is defined by its natural wonders. The coastal state’s diverse and stunning landscape, which includes Crater Lake and Mt. Hood, provides a home to thousands of creatures – from marine life and birds to elk, cougars and bears. Helping to protect the creatures that inhabit the area is the Oregon Department of Fish and Wildlife (ODFW). The ODFW has roots that date back to 1872, when the first fish hatchery was built on the Clackamas River. Headquartered in Salem, ODFW today oversees 1,788 acres of land, with specific areas dedicated to recreational, conservation and recovery. Recreation oversight is split into two divisions: wildlife, where populations are tracked through license and tag sales; and fish, which manages native Oregon marine life, hatcheries, and the stocking of different breeds. An ODFW employee for almost two decades, Couture manages the 35 hatcheries operated by the ODFW. His daily responsibilities include servicing and maintaining the grounds and hatchery fleet; transporting trout and salmon, among other species, to and from the hatcheries; and hauling heavy, awkward-sized oxygen tanks and other materials to different parts of the facility. Two-thirds of the ODFW staff work in field offices, hatcheries, wildlife areas and other facilities throughout the state. This puts resource managers close to the resources they’re managing, and in touch with local hunters, anglers and wildlife viewers. 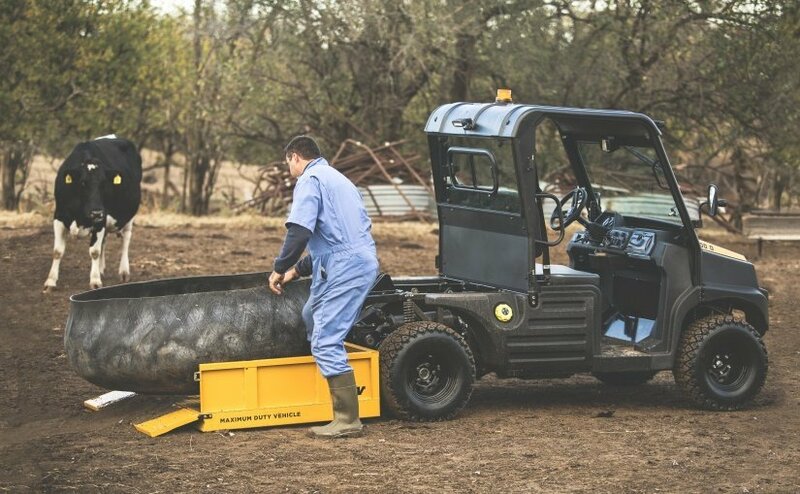 A day’s work often includes accessing areas of land that aren’t always easy to get to with a full-sized vehicle such as a pickup truck or van. 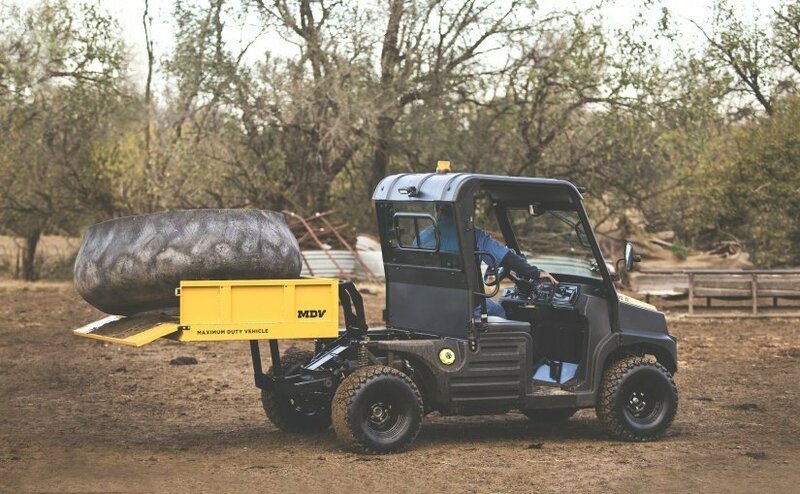 Wanting to keep productivity levels high and his team safe, Couture began researching new utility vehicles that could do just as much, if not more, than his last. 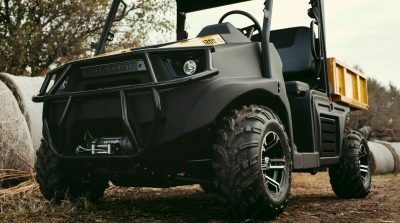 He wanted a true workhorse that would be able to meet the demands of the ODFW team: a durable, comfortable and easy to maintain UTV capable of helping his staff work as safely and efficiently as possible. 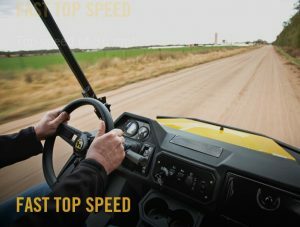 It was then that the newly introduced Maximum Duty Vehicle (MDV) from Hustler Turf Equipment caught his eye. 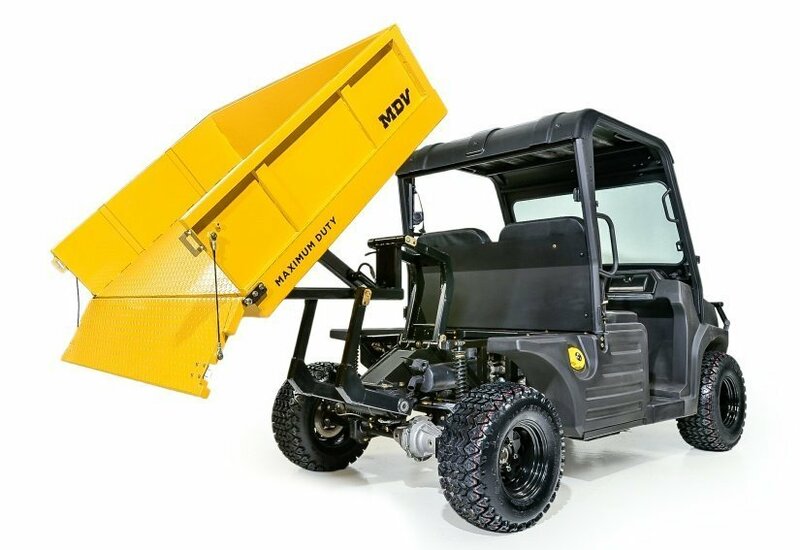 Designed for heavy-duty applications, the MDV features LeveLift technology, a patented, labor-saving cargo box that allows users to lift up to 750 pounds from the ground and dump material from any point in its arc of motion. “The LeveLift provides a way for my staff members to effortlessly lift and transport compressed oxygen tanks that weigh 80 to 100 pounds, as well as heavy water pumps,” he says. Think about the jobs that you or your employees do every day. How could the MDV benefit you or your organization? Submit your ideas using the button below. What would you do with a Hustler MDV? 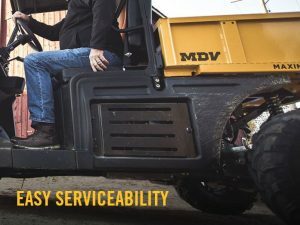 A wide range of accessories are available for the Hustler MDV to help you get more done and keep you comfortable on the job all day long. *Denotes accessories not show on the picture. ROOF Provides year-round weather protection to operator and passenger. DOORS Provides comfort in inclement weather. FRONT WINDSHIELD Blocks wind, dust and other weather elements. WIPERS Helps resist rain, snow and ice buildup on windshield. HEATER/DEFROST Keeps operator warm on a cold winter day. SIDE MIRRORS* Offers operator expanded visibility. REAR VIEW MIRROR* Expands operator visibility. HITCH/WINCH MOUNT (front) Pulls tough loads and secures vehicle to trailer. BRUSH GUARD Protects the front of vehicle. WORK LIGHTS Provides a wide range of light (ideal for tasks at night). 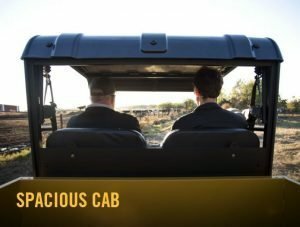 BEACON* Provides excellent visibility for vehicle bystanders. ALUMINUM WHEELS Presents a more polished appearance to vehicle. 440 MAG 25″ x 10″ – 12″ More aggressive tire for extreme conditions. Are you ready to step up to a Maximum Duty Vehicle? Wenger Equipment LLC is your local dealer for the entire Central WI area including the cities of Wausau, Merrill, Stevens Point, Marshfield, Stratford, Medford, Athens and more. 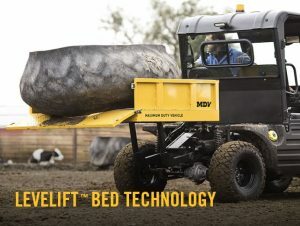 We offer onsite demonstrations of the MDV with LeveLift so you can see for yourself how a Hustler MDV could benefit your situation.